Majora’s Mask is definitely my favorite Zelda, though for different reasons than most. While I love the side-quests and the depressing themes present, what sells the game for me is the dramatic and serious elements in the game. The Moon is going to crash and kill everyone in Termina if you, the hero, do not intervene and save them. Nothing in Termina will remain. All those characters, with their intricate routines and side-quests… gone. Tragic, isn’t it? Except for the part that all of this simply happens in Link’s mind as he comes to terms with his possible death. Hit the jump to see my thoughts! Now, I’m not going to be bashing this theory. It’s very well put together, and has many good points. For those unfamiliar with the theory in question, I will outline it briefly. 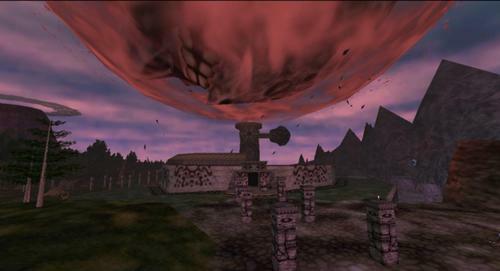 This theory revolves around another common theory for Majora’s Mask; the theory that each main location in Majora’s Mask represents the five stages of grief. That theory I believe, but I think it is just put in by Nintendo due to how depressing of a game it is, and having the areas represent the stages of grief just adds to the depressing nature. Denial, the first stage of grief, is Clock Town. Notice how most of the citizens of Clock Town on the first and second days go about their business without any regard to the moon falling, when one just has to look up at the sky to see the obvious impending doom. Yet, not even the Astrologer seems to make any mention of it. Denial is a very natural stage to experience, and can range from phrases such as, “This can’t be happening,” to complete feigned ignorance, which is what seems to be happening in Clock Town. Next up is anger, which is represented by the Southern Swamp, specifically the Deku Palace. You don’t have to think very hard about this to see the resemblance. Traits associated with the anger stage of grief include lashing out at others, refusing to accept responsibility, or placing blame on others, and refusing to accept possible reasons for the tragedy. Now, I’m not a psychologist, but the Deku King is pretty much a poster-boy for the anger stage of grief. Lashing out? Check. Placing blame on others? Check. Refusing to listen to reason? Check. So all in all, the Southern Swamp does seem to represent anger, especially when you group it in with the the other areas in the game. Then we have Snowhead, which is said to represent bargaining. This can be displayed mainly in two ways; saying things like, “If only I had done this, or that,” or, if the event is not a death, attempting to reverse the event through, well, bargaining. This is mostly clearly seen through Darmani begging you to bring him back to life, but there are other examples as well. Then, Great Bay, represents depression, possibly the most dangerous of the stages. People become unmotivated, sad, and more inclined to self-harm. Again, clearly seen through Lulu, who is basically catatonic after losing her unborn children, and understandably so. Lastly, there is acceptance, which is represented by Ikana Valley. The spirits of the royal family still roam the canyon, unsatisfied at their deaths. Since this is the case, this area focuses instead on Link. This is the loosest of the bunch, in my opinion. Link realizes that he can’t save everyone, and at the start of the game, he can’t accept that. Every time he does help or saves someone, he eventually has to turn back time and undo what he has done. In other areas, Link was forced to take up the identities of a Deku, and of Darmani and Mikau in order to progress in his quest. However, in Ikana Valley, there are no identities to assume, and Link is just himself, so he is forced to come to terms with the fact that he can’t save everyone. Since Link doesn’t speak, it’s a little harder to see this one, but you can if you think about it. To me, Link comes out of Ikana Valley different, and more determined. He accepts that he can’t save everyone, can’t help everyone. But he still needs to be a hero and save Termina. This is why not many side-quests are unlocked after Stone Tower. Link has accepted that he cannot help everyone. But, what if all of this happens in Link’s head? What if it is a manifestation he made to come to terms with his death? To stress, if the above is true, this means that all the characters in Majora’s Mask don’t exist, and that Link isn’t saving anyone, besides himself. The Moon isn’t really falling, the Giants don’t exist, and none of it happened. I’m going to stick purely to game logic here, so no saying that Majora’s Mask is on the timeline, or that child Link must have lived to have children, because to me, that just ruins the fun. So, if all of that was done intentionally, if Nintendo knew the game wasn’t really canon, then why did they make such a serious and dramatic tone in the game? Take Ocarina of Time, for instance. Yes, the level of destruction Ganondorf causes is horrific, but there were still quite a few NPC’s alive even after seven years. They had time to wait for the hero, Link. Then, in one of the alternate timelines to Ocarina of Time, Ganondorf comes back to power, but there is no hero to stop him. The Goddesses have to intervene and flood Hyrule, but the Hylians were safe at the mountaintops, and managed to continue society. In Majora’s Mask, these people are all going to die in three days if you don’t save them. There’s no way around it. This is where the quest seems like it matters most, and yet we are supposed to believe it doesn’t happen? That it is all in Link’s head? If this is true, it almost completely ruins my experience with Majora’s Mask. I love how it feels like you really are making an enormous difference in Termina, as opposed to other games, where even if you fail, the Goddesses will find some way to correct it. We even have the Downfall Timeline where Link dies in Ocarina of Time, and Hyrule wasn’t destroyed! 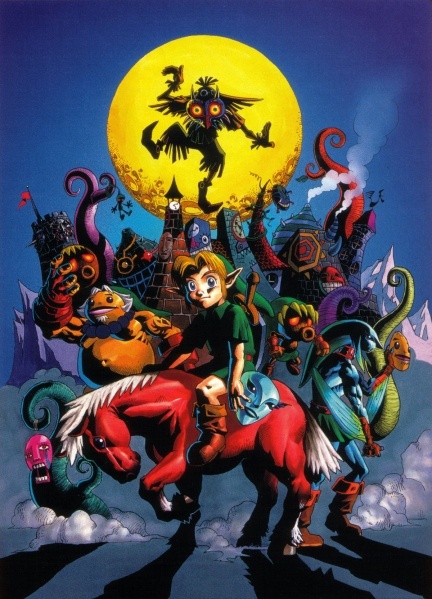 So, not only did Nintendo raise the stakes considerably with Majora’s Mask, but they also made developed characters that had their own side-quests and routines that they followed each day. Character that are definitely among the best in the series. Again, would Nintendo save such a character driven game for a story that didn’t even really happen? The purpose behind the character development is, I presume, to make you care more about saving these people’s lives! Therefore, it seems a stretch to think that it’s all just in Link’s mind, and it would ruin the atmosphere of the game for me, if it were true. But what do you think? Do you think Link could be dead during Majora’s Mask? Or do you think it’s a little far fetched? Do you think that Link being dead would ruin the atmosphere of the game?